A filtered photo from the Curiosity rover's Mastcam imaging system shows the transit of Deimos across the sun, as seen from Mars on Sept. 17. NASA's Curiosity rover has sent back more snapshots of Martian mini-eclipses, the pyramid-shaped rock it's studying up close, and its own star-spangled hardware. The first pictures from Curiosity's eclipse-watching sessions were received last weekend, focusing on Phobos, the larger of the Red Planet's two moons. That picture showed the satellite taking a slight bite from the sun's edge. Now we have images showing the smaller moon, Deimos, passing across the sun's disk on Sept. 17 (also known as Sol 42 of Curiosity's mission). 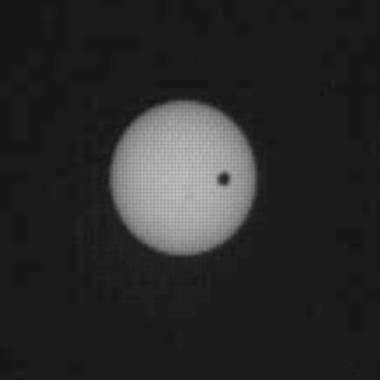 Take a look at this animated GIF image from the good folks at UnmannedSpaceflight.com, and compare it with these videos from June's transit of Venus. Weirdly similar, right? There's another shot of a Phobos transit, taken on the morning of Sol 42 on Mars. The Red Planet's moons never completely cover up the sun's disk, but the Sol 42 transit darkened more of the sun than the earlier Phobos mini-eclipse did. Detailed analysis of these transit pictures will help the Curiosity team get a better sense of the interior structure of Mars and its moons, as Texas A&M's Mark Lemmon explained a couple of days ago. Phobos and Deimos aren't all that different in width (14 miles vs. 8 miles, respectively), but Phobos' apparent size as seen from the Martian surface is noticeably bigger because it orbits so much closer (5,800 miles vs. 14,580 miles for Deimos). Two images of the top half of the rock known as Jake Matijevic, captured by Curiosity's Mastcam imaging system, are shuffled in this video to produce a 3-D illusion. The shadow of Curiosity's robotic arm can be seen extending toward Jake in this view from the rover's navigation camera system. This view of the American flag medallion on NASA's Curiosity rover was taken by the rover's Mars Hand Lens Imager on Sept. 19 (Sol 44). The flag is one of four "mobility logos" placed on the rover's mobility rocker arms. The circular medallion of the flag is made of anodized aluminum and measures 2.68 inches (68 millimeters) in diameter. The medallion was affixed with bolts to locations on the rocker arms where flight hardware was once considered, but ultimately deemed unnecessary. The other three medallions on the rover's rocker arms display the NASA logo, the Jet Propulsion Laboratory's logo and the Curiosity mission logo. Curiosity's view of the transit of Deimos served as this week's "Where in the Cosmos" puzzle picture on the Cosmic Log Facebook page. There were lots of interesting guesses as to the nature of the black spot (Venus? Earth? Mercury? Planet X? ), but Robert Dryden was the first to identify it correctly as Deimos. To reward his sharp eye for mini-eclipses, I'm sending him a complimentary pair of cardboard 3-D glasses, provided by Microsoft Research's WorldWide Telescope project. Those red-blue specs will come in handy for checking out Curiosity stereo views like this one, and this one, and this one. You can also feast your eyes on the 3-D views of the shuttle Endeavour produced by the Planetary Society's Emily Lakdawalla. Want to be in on next Friday's puzzle? All you have to do is "like" the Cosmic Log Facebook page.